When your little ones are younger, you want them to have their feet covered up, obviously you don't want those little tootsies getting cold but one thing I have always struggled with, is getting them to keep anything on their feet and the other problem there is that quite often I'm left with odd socks, you know they have gone to that special missing sock land never to be seen again. Layla is just going through that stage now, where everything must be put in her mouth, including the smelly socks off her toes. Funky Giraffe very kindly sent me a pair of their Moccasins to try out and review, I hope you all have your fingers crossed that these will stay on that little pair of feet!! These lovely Moccasins come in a variety of designs, so there will definitely be one suitable for any child. I picked the gorgeous Flower Fancy design, half because it had my favourite colour purple on there and half because they were just so unbelievably cute. Available in sizes 1-4, these are perfect for both little ones who sit still or for those cheeky ones that are on the move!! Made with flexibe leather soles and cotton sock for the upper, I can't find a single negative thing to say about the. 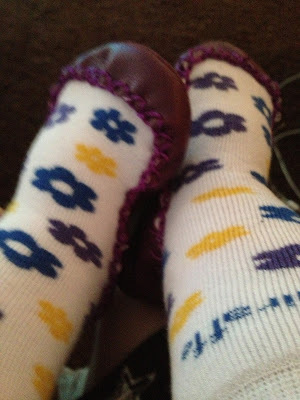 Simple to put on, no fighting to squish feet into stiff pairs of shoes or trying to stretch socks to fit the feet. The flexibility of the sole means that your little ones feet are allowed to stay in their natural positioning, mean they can strengthen and develop correctly. The cotton sock is superb, soft and comfy. You can have them pulled right up covering your child's legs or rolled down if it is a warmer day, making them ideal for use all year round. They grip the leg which makes it harder for your little one to pull them off, although I have to say Layla did still manage it, she is one determined monkey. The price for one pair is £7.00 but if you buy more than one pair then you get them at a discounted price, Either way, I think they are great value for money. You can't tell me that that pair of feet in the picture above aren't adorable!! Now I am pleased to say that after reviewing these beautiful moccasins, Funky Giraffe are allowing me to give away not one but 2 pairs of moccasins, that means 2 winners and you get to pick out the design!!! If you would like to be within a chance of winning, all you need to do is fill out the Rafflecopter form below. This competition is open to UK residents only and will finish at 11.59pm on the 4th of August 2013. I would choose Superstar blue! OMG How cute! Love them all but would choose the CHEERY CHERRYS! I love the superstar blue. I like tha Nautical Navy, its lovely. I like the white funky giraffe ones best! I'd pick the Floral Fancies, so cute. I would choose Black Spotty.